Take the worry out of domain names, email addresses, configuration & web space - we provide professionally managed hosting for all your website needs. Please note that we only offer hosting to clients who have a website designed by ourselves, whether it be a single page web design or just a page displaying your logo. We’ll register your website address (domain name) and configure your email addresses and web hosting on our servers. In addition we'll also create a simple web page with your company logo, brief company description with images, contact details and a contact form - perfect if your new to the internet or would like professional management of your online presence. Other clients have used this option to display their folded flyer or flyer designs to give more company detail & branding, please see our online presence gallery above for some ideas. All domain names are registered to you as the owner, we are just the administrator of the domain. This means that any time you wish to transfer the domain you have the option of doing so. Up to 10 email addresses with web mail access, plus MS Outlook and mobile phone integration (i.e john@yourcompany.com). Simple web page with your company logo, brief company description with images, contact details and a contact form. We are the only company you will need to liaise with for your website, domain names and email addresses. Either give us a call or send us an email and we’ll make the changes or configure new email accounts on your behalf. Up to 15 email addresses with web mail access, plus MS Outlook and mobile phone integration (i.e john@yourcompany.com). 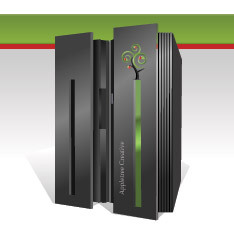 Web hosting for an Appletree Creative 1 Page Web Design including contact form processing. Google Maps business page created and activated. Great for local Google searches. Google Analytics configured & activated, with advanced visitor statistics emailed to you on a weekly basis. Managed web site text updates from our developers, ensuring your web page & site remains operational and updated by professionals. Up to 25 email addresses with web mail access, plus MS Outlook and mobile phone integration (i.e john@yourcompany.com). Managed web site text updates from our developers, ensuring your web page & site remains looking great and updated by professionals. Simply enquire today and a member of our team will discuss your requirements. We'll then register your chosen domain name with you as the owner, configure your company email addresses and setup your simple web page all on our servers. It's that easy!